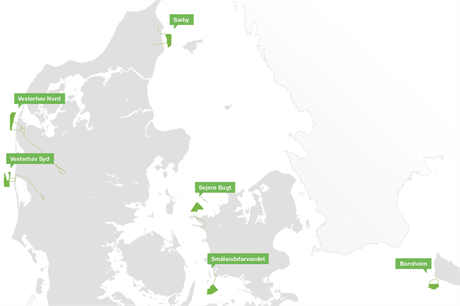 DENMARK: Developer Vattenfall has pushed offshore wind costs further down after being awarded the rights to develop 350MW of nearshore wind capacity in Denmark, but it is still uncertain whether the government will fund it. Vattenfall was one of three bidders in the auction and placed the lowest bid of DKK 0.475/kWh (€0.0638/kWh). A WPD-Hofor joint venture and a European Energy-led consortium are also believed to have bid. The Swedish firm will develop two sites; a 170MW project at the Vesterhav Nord site and a 180MW site at Vesterhav Sud. Both projects are situated in the North Sea, off Denmark's west coast. The €63.8/MWh winning bid again lowers the cost of offshore wind, beating the previous record of €72.70/MWh set by Dong Energy at the 700MW Borssele sites, off the Dutch coast. But it is unclear whether the projects will go ahead. The Danish government is currently considering a new budgetary plan to 2025, which would completely cut the financing for the nearshore programme. "It is no secret that the government wants to abandon the construction of the coastal wind turbines, which we will continue to work towards for three reasons," said Danish energy minister Lars Lilleholt, following the announcement of Vattenfall's winning bid. "Firstly, the major coastal [turbines], at around 180 metres high, will blemish the beautiful Danish coastline and destroy our unique natural scenery along the west coast. "Secondly, the government believes ‘green power’ at sea, where applicable, should be further away from the coast. It will not disfigure our unique coastlines and should be seen in light of the fact that the price of offshore wind far out at sea, according to the wind industry itself, is expected to be halved over the next ten years. "Finally, support costs to the coastal wind turbines almost doubled since we made the energy agreement in 2012, " Lilleholt added. Vattenfall country manager Ole Bigum Nielsen said: "The price [DKK 0.475/kWh] is more than 30% under the price cap in the energy agreement from 2012 set, and sets a new world record." Vattenfall also said local communities would have the opportunity to buy shares in project, with up to 20% of the project cost available. Speaking before the licensc was awarded, Nielsen told Windpower Monthly the government "could not say no" to the low-cost bids. "The whole industry wants to continue with the 2012 agreement, but for the government it is all about money," Nielsen said in early September. "The government cannot say no [to the projects] for financial reasons," he added, saying the government would need a different reason to cancel the projects. "The whole uncertainty is unusual, it is hard to explain to our colleagues. It is not good for Denmark, which still has a chance to be ahead of the game [in offshore wind]." Lilleholt argued that the costs still remain too high: "It is great that the industry has managed to lower the price so significantly. Support costs however will be almost double or DKK 1.7 billion higher than expected when we made the energy agreement in 2012. This is a significant additional expense that the government has not allocated funding for in our 2025 plan." The Danish energy ministry said electricity prices had fallen since the 2012 agreement, meaning more support would need to be picked up by the state under the feed-in tariff system.